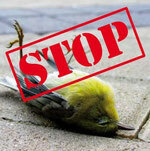 Birds can not reflective glass perceive as an obstacle and therefore fly against the glass. By raptor silhouettes is the birds using natural enemies danger deluded. Conventional raptor silhouettes are very obvious and ugly. Therefore silhouettes have been developed that are only visible under UV light. For human eyes, the silhouettes are barely visible, but birdseye perceive they can - a real innovation in birds! The stickers are available in sets of five pieces including plastic scraper available. Attaching density: are usually for a glass surface about 5-10 per square silhouettes recommended to achieve the desired protective effect. The distance of each sticker to each other should not be more than 10cm. Protects birds before it hits glass. With the Birds marker you get a high quality and thoroughly tested product. 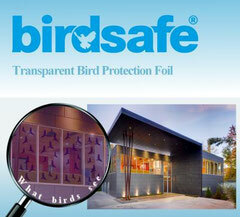 The clear, nearly invisible strips contain highly effective protection against bird impact. Protective effect lasts usually for about 3 months, but depends on UV radiation and abrasion from cleaning operations by. 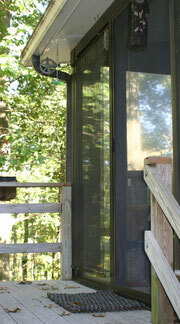 The Bird Screen Bird Screen prevents the bird collisions effectively - without big drawback for viewing. It consists of a plastic grid, which can be fastened directly by means of suction cups on the outer side of the window. Alternatively, the Bird Screen also be attached by screws to the frame. The bird screen acts as an insect screen. Birds perceive the grid and not fly it. The length of the Bird Screen can be flexibly adjusted by the removable frame and the zuschneidbaren curtain fabric.